Hello! Welcome to my Featured Artist Page! I love watercolors! My favorite techniques are wet on wet, splattering and dry brush. 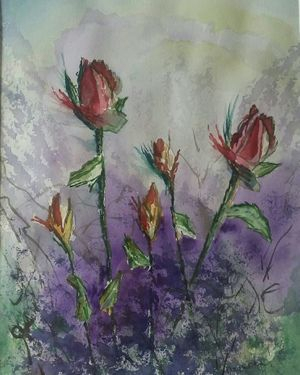 I have been painting in watercolors for many years. Besides being a member of the Williamsville Art Society, I am also a member of the Niagara Frontier Watercolor Society. I have exhibited my work in the Williamsville Art Society annual shows. I am a member of the Society of Children's Book Writers and Illustrators and the local Buffalo-Niagara Children's Writers and Illustrators. I am currently writing and illustrating my first children's book - in hopes of publishing it! I hope you enjoy looking at my art work!